Architect Olle Lundberg in the Lundberg Design offices in San Francisco's Dogpatch neighborhood. The wall behind him is covered with Hot Sauces collected from his world travels. We first met Olle Lundberg as we often meet other neighbors -- at the bar in Serpentine Restaurant. As we chatted we realized that this was the person responsible for the design of many of our favorite spots including Mourad Restaurant, Slanted Door Restaurant, the whiskey bar, Hard Water as well as many other projects around San Francisco. Although his firm, Lundberg Design, might be known for these and many other high profile restaurant projects -- he actually has quite the diverse roster of clients including personal residences, wineries, corporate headquarters and as he told me recently, even SFMTA bus shelters. 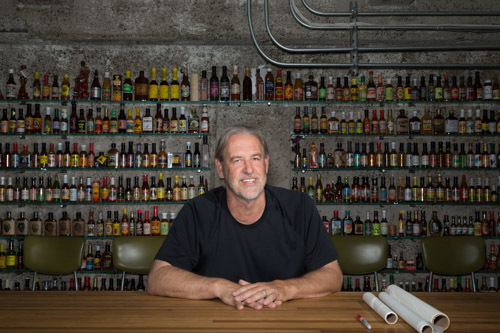 In Dogpatch he has lent his team's design expertise to such projects as the Museum Of Craft and Design's Gift Shop and the Dutchman Flat's Dispensary. His studio fronts Third Street and backs out onto Angel Alley. The interesting angles of the site are thanks to Tubbs Cordage Company that occupied the site from the late 1800s to the early 1960s. You might have passed by his studio often -- it is hard to miss with the front door that looks like an airlock and the Vespa parked out front. The back of his studio boasts an old Airstream and you might spot a Labrador or two running around. We met up recently with Olle in his studio in the Hot Sauce bunker room to talk about his current projects and how a guy born in Sweden, raised in Ohio and many other U.S. cities -- ended up in Dogpatch. When I finally became an architect I felt like I had found what I had been looking for as a career -- a creative outlet that came easily to me. Not that it wasn't hard work to get to where I am today but that it felt natural to me that I should be doing this work. I like to say I was made in Sweden but born in the U.S. I arrived two weeks after my parents immigrated to the U.S. to live in Ohio. My dad was a PG&E chemical engineer who moved into managing paper mills. So we moved around a lot. I went to a different school every year until high school. All that moving around made me very self-sufficient and I was exposed to a lot of different houses -- a lot of different floor plans. After high school I went to a boarding school in Connecticut. It was a different experience for me as most of the other students were from wealthy East Coast backgrounds. I liked the academics and I also did a lot of athletics -- mostly football. I remember that most of the students already had their careers mapped out for them -- bankers, lawyers, etc. That gave me a new perspective. I knew that path wasn't for me and that I wanted to shape a more creative career for myself. I was a carpenter in high school and college and I loved the physical aspect of that type of work. And I loved being outside and the process of building something. 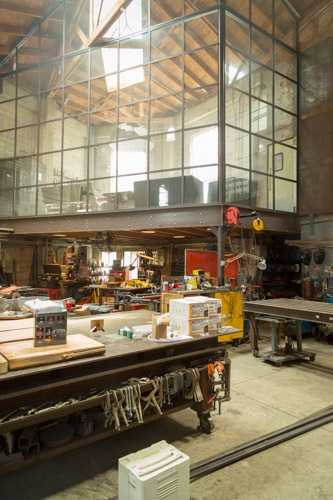 The metal shop at Lundberg Design in Dogpatch. Doing their own metal work produces unique results for clients. I knew I wanted to go to a small college but didn't know what to study. I went to Washington and Lee University in Lexington, Virginia and started as a business major. I took Economics class and lasted one day. I switched to an English major right away. I thought maybe I would be a writer but while I loved the end product I didn't like the process of getting there. I finished my major early but I still needed coursework to graduate so I took a sculpture class. I had a very young professor from New Orleans. He was very inventive, very hands on. He was in to all kinds of processes including metal work which I loved. I immersed myself into sculpture for more than a year. That's where I got my start as a fabricator. My brother (editor's note: artist Peter Lundberg) is an amazing sculpture artist. An interesting side note is that after my first year at school I had to live off-campus as dorms were only for the freshman students. I found an old chapel outside of town and convinced my dad to let me buy it for $10,000. A friend partnered with me and we fixed it up and leased out three rooms to other friends to pay the mortgage. That house ended up paying for my grad school when we sold it. So now I'm trying to decide between law school or business school for grad school. I decided I really wanted to go to Stanford Business School. Stanford wait-listed me and told me to go do something interesting for a year and then they would look at my application again. So I decided to go to architecture school for a year. I got into Yale and University of Virginia. Since I was an in-state resident Virginia was the clear choice at $5,000/year tuition vs. $25,000 for Yale. I felt like Virginia was a better fit for me given that I hadn't had any prior architecture experience. After a year I told Stanford I wanted to finish school and then when I graduated I turned them down -- I no longer wanted to go to business school. After I graduated I worked in Charlottesville, Virginia for a former professor of mine at his architecture firm. I moved to California in 1980 on a whim. I had been here once as a teenager and loved it. I had cousins in Palo Alto and they took us to visit San Francisco. We went to the Haight and some guy offered me a joint. I was 13. I didn't take it of course but I thought that was very cool! San Francisco felt like a European city to me and I liked the diversity and the tolerance of the city after having lived in the Midwest which isn't the most diverse part of the world. I was offered a job in San Francisco in 1980 for an architecture firm which is now Perkins + Will. I was the go to person for their residential projects. A pivotal project for me was when I decided to design a house for my sister who lives in Connecticut. It came in at twice the budget so I did the work myself. It took two years. After that experience I started my own firm. We market our firm differently than most architecture firms. We market ourselves as designers. Our work is very personal and we want to work with clients we connect with. We are always looking for projects that we haven't done before which is why we have such a diverse client list. We are always looking for the big ideas -- on ways we can be clever and innovative on a project. When I'm considering a new project I always have this gut reaction to how to approach the project. Most of our work is focused around a singular big idea and what materials we can use to execute the idea. And we are always looking for using materials in unusual ways. Our studio includes a metal fabrication shop which allows us to know how to put materials together. The shop also helps us solve problems as they come up. We also use the shop to create signature pieces for our projects such as a reception desk or light fixtures. 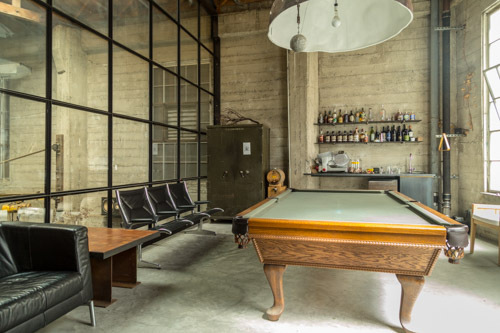 The Pool Room at Lundberg Design in Dogpatch. The offices used to be an auto repair shop. We have been in Dogpatch since 1996. Before we found this place we leased studio space at various spots in SF. We had a studio at Tehama and 16th but it was red tagged after the earthquake. We then moved to a spot in SOMA on 12th Street with the goal of buying a building in SOMA so we could control our future a bit. But this was during the first tech boom so we missed out on the opportunity by about a year. All the small buildings got snatched up first during this boom time. I had an SBA loan so I cast a wider net in my search. We focused on the old Mission Police Station that was no longer in use at 25th Street that was going to go up for auction. Two days before the auction a homeless advocacy group got involved and wanted the city to consider that site for housing. That got a lot of press and public outcry for the city to take action so then Mayor Willie Brown took it off the market. That spot was never right for public housing but now everyone knew that it was available so the price went up. We lost out to another architecture firm. I heard about our current place from one of my employees. It was a former SAAB repair shop. We think it was originally built in 1933 as a mattress factory but never used in that way. It might have been used as a stable at one time -- we have found a lot of horse shoes. We also looked at a really cool space on Yosemite Street but I had a sensed that Dogpatch was going to change faster than that neighborhood. It was filthy as auto repairs shops are but I loved the geometry of the space. It has a dramatic central space and concrete walls and wood beams. I used all of my SBA loan to buy the building and the last bit of my credit line to sand blast all the years of accumulated dirt from the space. I had never been in Dogpatch before this. Never had a reason to go to this neighborhood. There was no Mission Bay at the time so this neighborhood seemed far from the main part of San Francisco. It seemed like a pretty sketchy place. There were no retail shops or decent restaurants -- the space where Serpentine is now was a Chinese Restaurant. We liked that the Hell's Angels had a clubhouse next door. Not that we have interacted much over the years but it gave us a good feeling that they were nearby. What's the deal with all this hot sauce? My wife and I love to travel and we love hot sauce. We always pick up two bottles when we travel -- one to consume and one to display in this room. We have been married for 28 years so that's a lot of hot sauce. Honestly I'll be doing this until I can't do it anymore. I've worked hard to have this firm, this life style so why would I give it up. I find building things to be very therapeutic so when I'm not doing this I'm working on a cabin I purchased with my wife in 1996. We have been using mostly recycled materials. We head there every weekend to work on it. 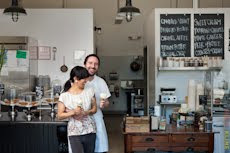 Mike and Stephanie Gaines of Glena's restaurant in San Francisco's Dogpatch neighborhood. We were eager to try the new Mexican restaurant that had been rumored to take over the space where the Mexican/Salvadorian Restaurant, The New Spot, had been a favorite of residents and workers in the neighborhood on 20th Street at Illinois for more than five years. The restaurant we discovered when Glen'a opened in February 2016 was not a traditional Mexican Restaurant and in fact, is actually more of a California cuisine bar bites and craft cocktail restaurant than a Mexican Restaurant at all. Glena's has now become one of our favorite places to hang out in Dogpatch and given the increasing crowds, we are not alone in feeling that way. When you enter the small space it feels well, breezy. And that's not just from the wind that can howl along 20th Street some days. The small space had been transformed with fresh white paint, green tile, and the a rich dark wood for tables. A bar now dominates the space. There is no artwork on the walls all lending to the open feeling of the space. If you look close you can see a small figurine on the bar called Ekeko -- a bringer of good luck and prosperity from Bolivia -- a nod to owner Stephanie Gaines birthplace. And yes, there are tacos and margaritas but there is also a Fire Dog (beef hotdog) and Fried Chicken Torta sandwich that can be washed down with any number of tasty cocktails. The space and the food and drink menus reminds us of places we used to frequent when we lived near the beach in Southern California. It has a distinct beach bar bite vibe and you almost expect to feel the grit of sand under your feet as you take your seat at the bar or one of the tables. So we weren't surprised to hear that chef owner Michael Gaines grew up in Southern California. 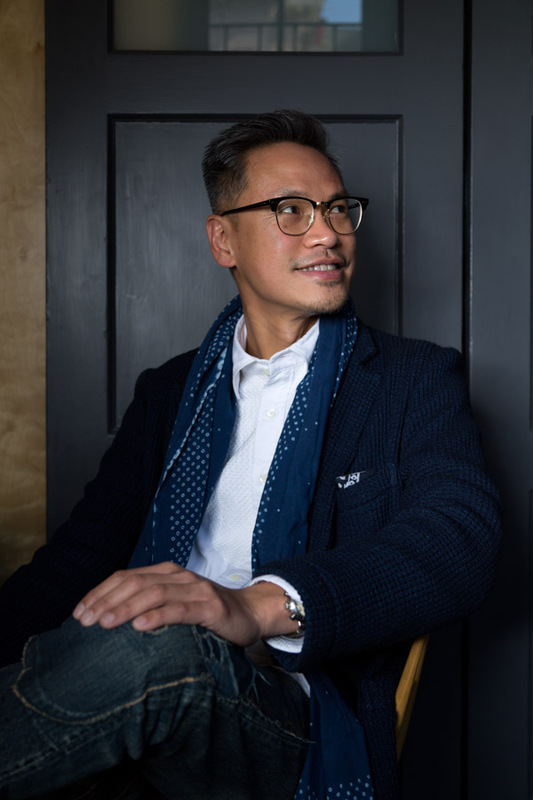 He and wife and co-owner, Stephanie, have many years of fine dining and start up restaurant experience between then including stints at Gary Danko, Manresa, Delfina, Central Kitchen, Plow and Kin Khao. But they have always had the shared goal of wanting to someday open their own restaurant. 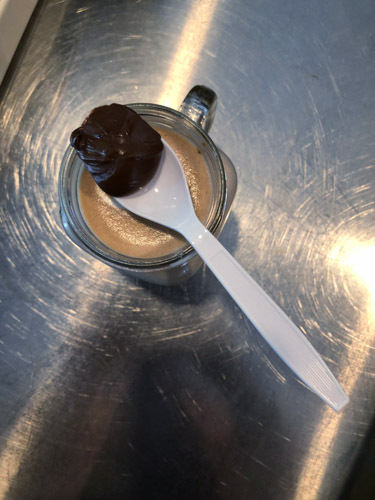 It is gratifying when a customer gets what we are trying to do -- we want customers to have a happy time and eat food made with good quality ingredients. Go ahead -- stay awhile -- have another drink. Relax with your friends. I've always loved cooking but certainly didn't get that from my parents who didn't cook at all! I mostly watched cooking shows and then tried out various recipes. And I have been working in restaurants for most of my adult life. I was born in Bolivia but moved to California when I was four years old. My dad is from Kansas and my mom from Tennessee. My dad grew up in Bolivia -- his parents were missionaries. My mom was an artist and was studying textile weaving techniques in Bolivia when they met. My dad got a job teaching middle school in Martinez and my mom was a professor at Cal State Hayward so we settled in Berkeley. But I never spent any summers in California as my mom was awarded grants to go to Peru and Bolivia every summer on archaeological digs. I have a vivid childhood memory of her describing to someone in great detail the right way to unwrap a mummy! I actually got to go on a dig with her when I was a teenager. I went to college at U.C. Santa Cruz to study environmental studies and art history. While I was in college I worked at Love Apple Farms in the Santa Cruz mountains. Love Apple Farms uses biodynamic and organic techniques to grow fruits and vegetables. It was there that I met David Kinch -- the chef and owner of Manresa Restaurant. The farm had a partnership with Kinch to provide his restaurant with fruits and vegetables. I actually also met Mike there but we didn't date until later. I didn't know any better so I asked David for a hostess job at Manresa! Of course they don't have that type of job there but he did hire me and I was front of the house and worked there through college. I graduated in 2008 which of course was a terrible time to be looking for a job so I did a bunch of restaurant gigs while I decided what my next step would be. I wanted a place of my own but needed an affordable place to live so with the help of my step father who knew a lot about sailing I bought a 27 foot Coronado sailboat and docked it in the Berkeley Marina. Mike and I had started dating in 2011 and he thought it was pretty cool I had a boat and he actually knew how to sail it. Mike was hired to work at Central Kitchen but the summer before he was to start he was offered a job as a chef on a mega yacht docked in Chicago. I went with him -- we had been dating all of two weeks. 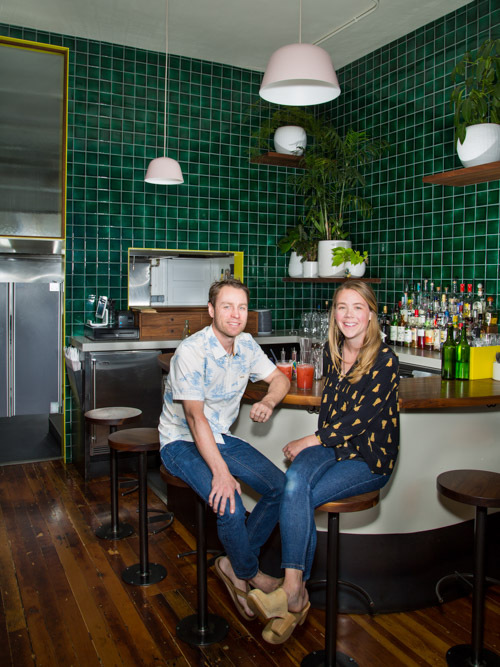 When we moved back to San Francisco I worked at several restaurants including Delfina and Four + Water before ending up at Plow -- the popular brunch spot in Potrero Hill. We lived in Hayes Valley for about a year but eventually moved to Potrero Hill in 2013, married in 2014 and still live in Potrero Hill with our two little girls. I've always been a front of the house person in a restaurant -- even if I wasn't hired from the beginning to be in that role! I think it is because I'm a great multitasker and I truly care about the restaurant and the customer experience. 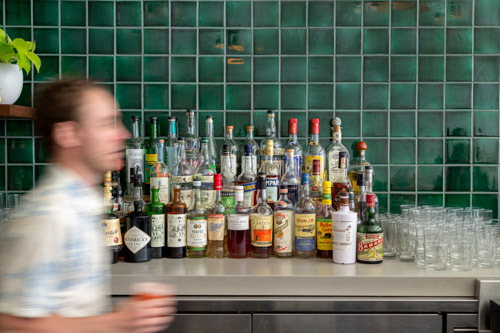 Mike Gaines speeds by the nicely stocked bar at Glena's in Dogpatch. I enjoy providing a fun, approachable dining experience for your friends and family. I like that I can be creative and make changes to the food or drinks on a whim. That's a bit more difficult to do in the fine-dining world that I came from. The type of food we are doing is really just bar food -- California cuisine. But it is good quality bar food and our bar program is solid. This is food I grew up on. I grew up on Balboa Island -- a small beach town located in Orange County in Southern California. My grandmother -- Glena -- taught me how to cook. She grew up in the Midwest and her mom was from Louisiana so her cooking was of the eggs in bacon fat type of food. Kind of a southern Midwestern style. Glena and my grandfather were great entertainers as well. She was a life long cocktail waitress so that is the sort of world they lived in. They had great cocktail parties and their house was perfect for that type of entertaining. She lived in Reno but she would often come and stay with us when we were growing up while my mom was at work. My mom worked in finance and my dad was a contractor. I was all set to go to U.C. Santa Barbara for college to become a teacher. But Santa Barbara is on the quarter system so I wasn't going to start until October. I got a job at a restaurant while I waited for school to start and was hooked. I had always wanted to cook but didn't realize you could actually have a career doing it. I came to San Francisco to go to the California Culinary Academy. My internship at Gary Danko turned into a full time job and I stayed there about four years followed by another four years at Manresa. I was also the opening chef at Central Kitchen and helped to open Kin Khao. But all along Stephanie and I wanted to open our own place -- to take all that we had learned from these Michelin starred restaurants about dining, technique and ingredients and create our own customer experience. We held pop ups around town to test the concept and opened Glena's -- named after my Grandmother of course, in 2016. We continue to adjust as we learn what customers want and how we work best. We started with just counter service now we have table service, for example. We are really proud of our bar program and customers can look forward to the cocktail menu changing seasonally. Matthew Campbell who made his mark at Comal in Berkeley recently joined as our bar manager. I think our small size and the ability to be creative with the program and make it his own really appealed to him. We hope to one day soon sell our chips and hot sauce to stores and other restaurants. Our space is small but we do offer it for private parties. We know customers can be disappointed when we are closed for a private party but that is just the reality of the cost of doing business in San Francisco. We hope to open more restaurants some day but right now we are just trying to staff this one. Finding and retaining good team members is tough for restaurants and we are no exception. We feel great that we are fully staffed right now and have a great team. We started looking in 2015 and looked for a long time in SF before we heard this spot might be available to lease. We were super close to signing a lease in Mission Bay at the corner of Channel and 4th Street across from The Market Hall. We live in Potrero Hill and would have loved to stay close to our neighborhood. It was a huge space and we were excited to get started but in the end the lease terms were too unreasonable and we had to pass on the opportunity. That space continues to be available by the way! So, we kept looking. Then we heard that the landlord of this space was looking for new tenants so we took a look. Even though it is a small space we were excited to find it. We know Dogpatch well since we live so close and are happy to be part of this community. We continue to learn what the neighborhood needs and have adapted since we opened to provide a fun place with good food and cocktails for everyone. Stephanie: I think for both of us this was always the goal to have our own place. So this is it! If I left the restaurant world I would most certainly be doing something related to art -- perhaps in textiles given my education and from being inspired by my mom's expertise. Mike: It's been so long since I have thought of anything else but restaurants but I have always had an interest in Oceanography -- in learning about preservation. Ekeko the Bolivian bringer of good luck and prosperity stands watch behind the bar at Glena's in Dogpatch, San Francisco. 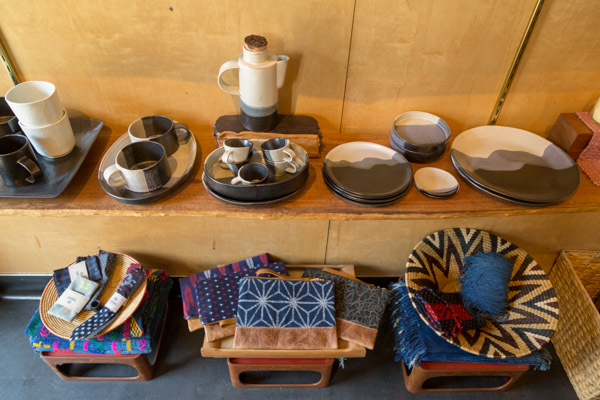 Hugo Lai among his beautiful ceramics and textiles at hugomento in Dogpatch, San Francisco. Entering the tiny shop of hugomento in the blue building on 22nd Street you can feel your shoulders relax. 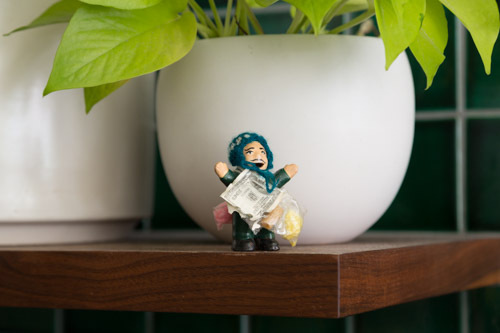 Soft music is playing, the faint scent of incense fills the air and your eye rests on various vignettes of ceramics and textiles arranged almost as if the owner had known how you would arrange them in your own home. Then you hear the rumble of what sounds like an ice machine behind a beautiful walnut Eames screen. 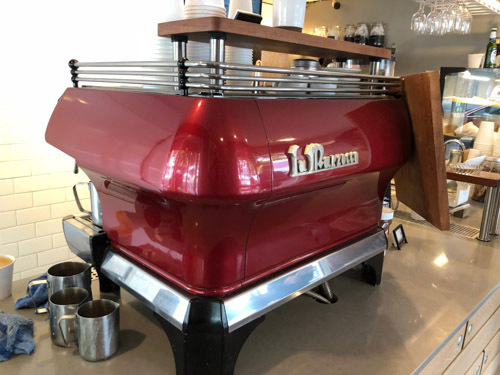 Yes, that is an ice machine and you can also spy a stainless steel work table revealing that this space was previously home to Piccino's coffee bar and most recently, the Recchiuti Chocolate retail space, Little Nib. But the rumblings don't break the spell of wanting to touch each piece of pottery. Go ahead, owner Hugo Lai encourages it and is on hand to share with you the artist's story for each piece in his shop. I have collected pottery for more than 15 years. I have met talented artists through the SF Open Studios and also throughout my travels. I was really drawn to pottery as I got to know the artists. I liked that you could touch the pieces, unlike a painting or other type of art. I especially liked hearing the story of the artist who made the piece and discovering what influenced them while they created the piece. You can feel the soul of each piece as you hold it. I realized that many of the artists are talented at what they do but not so much at marketing themselves or having a platform to show their work. This is especially true for emerging or unknown artists. 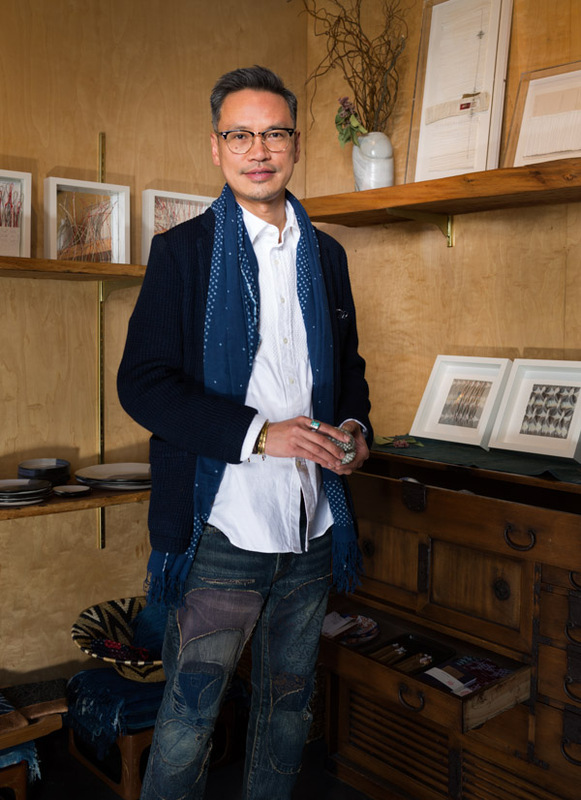 Curator Hugo Lai relaxes at his store hugomento in the blue building on 22nd street in Dogpatch, San Francisco. I was always creating art as a kid but realized I wasn't talented enough. 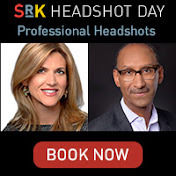 So when I came to the U.S. in 1989 for college, I knew I wanted to pursue something that was both creative and practical and advertising seemed like a good fit for me. So now that I was ready for a change, I knew in my gut I wanted to do something with art and specifically, pottery. I like to think of my shop as a hybrid gallery and concept shop but that is still evolving. The original pieces in the shop were from my own collection. I carry pieces by local artists as well as artists outside the U.S. --- storied objects from near and far is how I like to describe how I acquire items. And I want the shop to feel accessible -- not stuffy or off-putting. I've tried to arrange the pieces as how customers might display them in their own home. And my pricing is also accessible -- my ceramic pieces range right now from $30-$450. I also have a variety of textile pieces in my shop. In fact, in collaboration with Jack Fischer Gallery in the Minnesota Street Project, we are presenting an exhibition of textiles that showcase classic sewing techniques and Japanese traditions inspired by travel, fashion, photography. The exhibition opens May 5 and runs through May 30. I never really considered any other neighborhood. I moved to Dogpatch in 2000 into the then brand new building at 23rd and Minnesota. I had originally thought that I would start really small and have clients come to my Dogpatch condo by appointment but then two things happened -- the Minnesota Street Project literally opened across the street from me and second, Jacky Recchuiti, whom I have known for a long time from the neighborhood, told me they were moving down the block so their Little Nib space would be available if I wanted it. It almost seemed like the stars were aligning for me to open a real retail space. Dogpatch was becoming a destination for art thanks to the Minnesota Street Project and this perfect space was available. So I decided no more excuses and hugomento opened in 2016. Why did you name your shop hugomento? The "mento" part of the name spoke to me as I was brainstorming names for the shop. One of the main reasons is that I liked the word "momento" to describe the items I have in my shop. Momento means memory and keepsake. And that really spoke to me for describing what I hope to do. What is your advice for novice collectors? If you see an item you like -- pick it up and hold it. If it speaks to you then it is the piece for you. Don't look at the price. Expensive doesn't mean better. Perhaps a filmmaker -- I love hearing and telling people's stories. So my films would be character studies. And if money wasn't an issue I would always be traveling! I enjoy meeting people and discovering how they see the world. Storied objects from near and far at hugomento in Dogpatch, San Francisco. 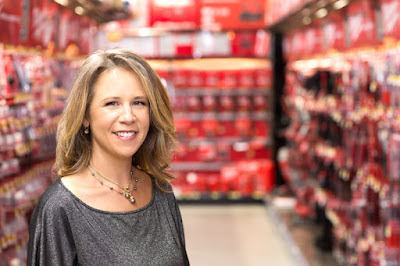 Jamie Gentner of Center Hardware in the Dogpatch Neighborhood in San Francisco. Jamie is a fourth generation hardware entrepreneur. When I was a kid growing up in Indiana the sight of my dad with his feet sticking out from under the kitchen sink or from beneath our car struck fear in my heart. Fear because I dreaded being asked to ride my bike to the local hardware store to pick up a critical part or a missing wrench that was needed to finish the job. Our local hardware was a lot of things but it wasn't helpful to a kid with scabbed knees with dollars wadded up in their pockets wandering the aisles looking lost. And I almost ALWAYS bought the wrong thing which incurred the wrath of Dad and yet another bike ride to the hardware store. Despite this hardware PTSD, I retain a certain fondness for hardware stores. The idea that if I looked hard enough I would find whatever I needed for whatever needed fixed in my life was fixed firm in my DNA. I seriously doubt though that my small town hardware store could envision the mix of customers that frequent Center Hardware. The clerks' head would be on a permanent swivel just taking it all in. Burners, makers, artists and oh yes, contractors, city workers, and more all find what they are looking for at Center Hardware. That poncho you need for the rainy day protest on Golden Gate Bridge? They have it. The tool you need to turn the bike you are taking to burning man into an art piece? They have it. Need an American flag for a photo shoot like I needed last week? They had it. Every town needs a hardware store, a bank and a grocery store. Dogpatch may not have a bank or a grocery store (fingers crossed on that last one) but when Center Hardware took over the at Third Street and 26th -- we finally had our hardware store. Of course they were always nearby in Potrero Hill but the walk from Mariposa under the freeway wasn't always the most pleasant of journeys. But they almost didn't reopen at all according to chief operating officer, Jamie Gentner. Because a city needs basic services like a hardware store and not only coffee shops. We keep things running -- Muni, the Department of Public Works -- you name it. Because I believe we need to show up. At the end of the day we felt that there was no one doing what we do left in San Francisco. But we have been through a lot. In 2014 Socket Site announced that our store was closing to make room for condos. Our business is still recovering from the misconception that we were closing for good. Our landlord hadn't told us yet of this decision so you can imagine how disruptive this was. 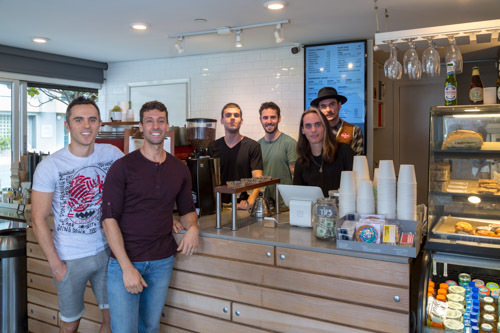 The Potrero Hill neighborhood really rallied to keep us at our Mariposa Street location. But thankfully we actually do have a good relationship with our landlord and they found us our current space which they also own. The electrical company that was in this building moved to a bigger space also owned by our landlords so we all just moved around a bit. I mean we can't actually be against development since we are in the business of selling tools to help that development! My grandfather's uncle lived in Ocean View neighborhood of San Francisco and started the Ocean View hardware store there after World War II. After the war it was a boom time so he was really busy. He asked my grandfather to help out. My grandfather was supposed to teach PE but he never left the hardware business. My dad, Keith Gentner, started helping out and he never left either. In 1980 Center Hardware at 4th and Brannan was looking for a partner so my dad merged the two businesses and closed the Ocean View location. My dad also made the pivot from only selling to the walk in public to also selling to the government and commercial businesses. In 1986 we move the store to the Mariposa location. I started helping out in the mid-1980s. I was eleven and wanted money to buy cassettes from Tower Records. I cleaned, did inventory and sometimes worked the cash register. I wasn't always so helpful. I left when I was 15 because I wanted to buy clothes from The Gap and I wanted that 30% discount they gave if you worked there so off I went to work at The Gap. I helped to open the first GapKids/Baby Gap in the nation on Burlingame Avenue. I worked there through high school. I thought I wanted to be a vet so I went to the University of Reno with plans to go to U.C. Davis later. But I flunked Physics 101 and that was the end of that idea. My professor generously let me pass the class but said my brain wasn't a physics brain and to find myself a new passion. Which I then decided was journalism so my final degree was in copy editing. When I graduated in 1998 I asked my dad if I could work at the shop while I figured out how to get a job in journalism. And just like my grandfather and my dad, I never left. And by the way, my son is now working here during the summers. Everyone in our industry is worried that Amazon will get into the hardware space. But the online market seems to have resisted the home improvement market. We are a needs based business which makes it tough to be an online business. You walk into a shop with a need and there is someone to help you. We like that we offer good, better, and best options -- every budget is served. In the future we hope to keep hosting local popups and perhaps a few seasonal neighborhood events like a pumpkin patch and a Christmas tree lot. We would also love to offer training classes. Moving to Dogpatch was a no brainer. We aggressively looked here. Greg Markoulis of the American Industrial Center offered us a spot in his building and it would have been a blast to be with all the businesses we already know but the space that would fit our business best was already occupied by Dogpatch Bolders. We wanted to be north of Cesar Chavez because we needed the convenience of moving materials down the Third Street corridor through town so this location right off of Third Street is a major win for us. This building has the same footprint as our old space but it has a better layout so we have about 35% more inventory. We love this neighborhood and try to source as many services from here as possible -- printing, photography, etc. We are an active member of the new Dogpatch Business Association as well. Dogpatch is very San Francisco. The entire neighborhood is like that Cheers TV show -- I can't walk more than three blocks without seeing someone I know and stopping to chat. Feels like everyone here is rooting for each other to succeed and has the "how can I help you mentality". I would love to buy a city block and have Center Hardware on the street level with a trade school above. But I guess that is still doing a version of this! So maybe I would indulge my passion for what I call junking -- finding treasures and restoring them. I love to collect from pre-1945 era. I live in a Victorian that I bought from the family that built it. I love the history of that and finding items to fill it.